Delegates at the 2014 annual RAM Conference agreed that RAM should support research on malaria by providing a scholarship for a qualified post graduate student, from PNG, Solomon Islands, Vanuatu or Timor Leste, to undertake PhD studies in Australia and upon completion return to their home country with thier acquired expertise. In close consultation with the Australian Institute for Tropical Health and Medicine (AITHM) based at James Cook University (JCU) in Cairns applications were sought for such a student to study any applied aspect of the transmission and control of a vector-borne disease. Appropriate research topics may be in fields including vector control, public health, epidemiology, environmental management for control of vectors, and drug-based interventions. The scholarship covers the candidate’s tuition fees, living allowance and overseas health insurance for the duration of the scholarship. Following a rigorous selection process the successful applicant is Mr Edgar Pollard MSc. 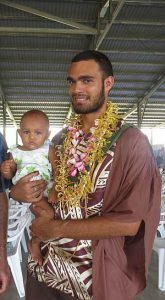 (pictured ) from the Solomon Islands who will conduct his research under the supervision of Prof. Tom Burkot of AITHM. Edgar commenced his PhD at James Cook University on 5th November 2015, his RAM coordinator is PDG Phil Dempster and his Rotary Councillor is Rtn Sharon Harwood.